The Grey Plover (Pluvialis squatarola) nest mainly on arctic tundra, from northern Russia to Alaska and Canada. It is a migratory bird. It is estimated that the number kustpipare moving through western Europe in the spring amounts to 247,000 individuals. The population that breeds east of the Taimyr in Siberia, winters from southern and eastern Africa, through Arabia, India, Southeast Asia to Australia. The North American population winters from the U.S. east and west coasts south to Argentina and Chile. Plovers feeds on worms, crustaceans, snails, insects and their larvae. TAGS: Bird painting of Grey Plover, bird sketch of Grey Plover, bird drawing of Grey Plover, bird art of Grey Plover, bird illustration of Grey Plover. The Guira Cuckoo (Guira guira) is a social, non-parasitic cuckoo found widely in open and semi-open habitats of eastern and southern Brazil, Uruguay, Paraguay, Bolivia, and north-eastern Argentina. The Guira Cuckoo gives off a strong, pungent odour. TAGS: Bird painting of Guira Cuckoo, bird sketch of Guira Cuckoo, bird drawing of Guira Cuckoo, bird art of Guira Cuckoo, bird illustration of Guira Cuckoo. The long-billed curlew (Numenius americanus) is a large North American shorebird. This species was also called "sicklebird" and the "candlestick bird". The species is native to central and western North America. In the winter, the species migrates southwards, as well as towards the coastline. The Crested Lark ( Galerida cristata) breeds across most of temperate Eurasia from Portugal to northeast China and eastern India, and in Africa south to Niger. The Eurasian Curlew (Numenius arquata) breeds accross temperate Europe and Asia. The Curlew is migratory bird, wintering i Africa and south Europe and south Asia. The bird's nest is a bare scrape on meadow. The Curlew eats small invertebrates probed from soft mud. 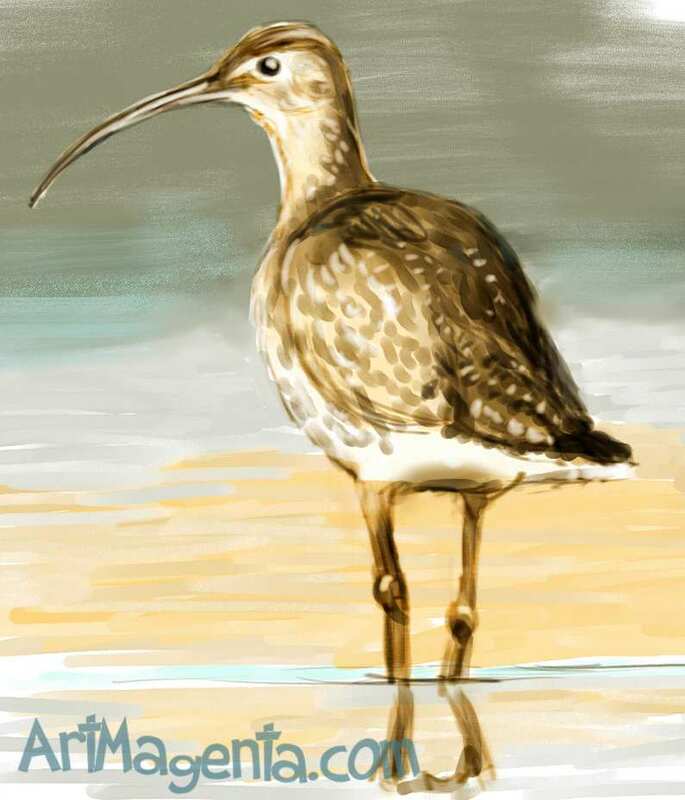 TAGS: Bird painting of Curlew, bird sketch of Curlew, bird drawing of Curlew, bird art of Curlew, bird illustration of Curlew.